Who doesn’t love Hallow’s Eve, candy, costumes and fun? For the most part we all do, but as pet-parents we also need to keep our furry family members in mind to make sure they enjoy a happy and safe night too. Doorbells and commotion are part of the fun for us, but some pets can become very anxious with frequent visitors to the door, and may react badly to noisy candy seekers. Putting anxious pets in a quiet area of the house, far away from the door with some tasty treats for distraction is one way to keep them happy and safe. Try the recipe listed in this post and stuff it into a Kong toy for long-lasting distraction. Even better, prepare the Kong (or Kongs) in advance and keep them in the freezer until they’re ready to use and they’ll last even longer! If you already know your pet is anxious around visitors or small children, the better option may be to forgo hosting trick or treaters all together. Leave your pets at home and head out to have your Halloween fun with neighbours and at community events instead. If you do have people coming to your door, you also want to make sure your pets are wearing proper ID, and are microchipped. Even the most docile dogs and cats may decide to chase some unexpecting ghosts and witches, or become startled and dart off. Chocolate, Raisins and Xylitol, Oh My! 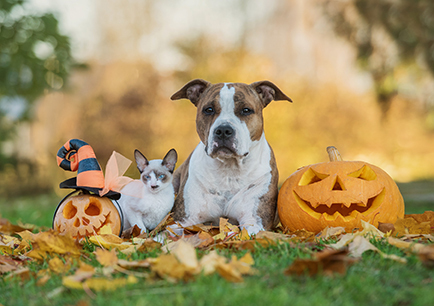 While the majority of pet-parents know of the dangers of their dogs ingesting chocolate, there are some other lesser known toxins to watch out for during the spooky season. Xylitol is a sugar substitute, often found in sugar free gum and candy. If ingested, it could turn Fido’s Halloween into a trip to the emergency clinic as it causes low blood sugar and liver damage. Definitely something to avoid! Another tip to keep in for day to day life is that Xylitol is now used as an ingredient on some sugar free peanut butter products. This isn’t something you would obviously think of, so be sure to exercise caution when making your purchases if you give your dog peanut butter as a treat on a regular basis. Grapes, and their more Halloween friendly cousin raisins, can also be very toxic to some dogs, causing serious kidney damage. Veterinarians have yet to figure out why this is the case, and it affects some dogs more than others, so for Goblin’s sake hide those chocolate covered raisins! And finally, while pet costumes lead to super cute photo ops, please don’t force your pet to do anything they’re not comfortable with. You want to make sure your pet is still easily mobile in their costume, and if they don’t like handling or are showing signs of stress (panting, licking lips, frequent yawning) please cut costume time short and opt for a festive bandana instead. While we hope you get into the festive spirit, please be mindful of bits of costumes and decorations (especially strings and ribbons) that a pet might mistake for a chew toy. If eaten, this type of ‘foreign body’ can be a real emergency requiring surgery, but it can easily be avoided with a little supervision and planning. We, the Treatwell Team would like to wish all off our Ottawa furry friends, and their parents a safe and happy Halloween! !